WHY HAVE BACKGROUND CHECKS FOR EVERYONE 18 & OVER? Lakeside For Youth is following this United Methodist policy by requiring all people attending camp who are 18 years old and over to pass a background check. These background checks do not require fingerprinting. WHERE DO WE GET THE BACKGROUND CHECKS? 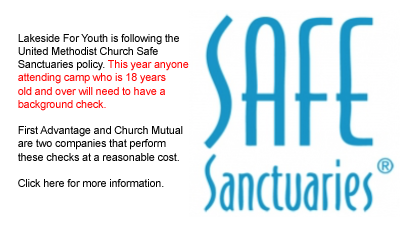 Your church may already have a relationship with a company that provides this service to comply with your own Safe Sanctuaries policy. If not, First Advantage and Church Mutual are two companies that you may want to consider. Your church will have to contact the company and establish an account for your church so you can sign up individually. No. Background checks are REQUIRED but these background checks do not require fingerprinting. Prices vary by company, but $4 - $5 is an average cost. There are many companies that perform this service. If you know of one that we should list, please email lakesideforyouth@gmail.com. WHAT DO WE DO AFTER WE GET THE BACKGROUND CHECK? Lakeside For Youth is not asking to see the result s of each person's background check. We are asking that a counselor sign off that each person 18 years old and over has completed and passed a background check.